Anguilla offers “The Good Life”. The epitome of calm and easy living, luxurious elegance and sophisticated style. At Prestige World we offer resorts, elegant villas and 5 star hotels. Most accommodation is located on the pristine shoreline, for your comfort and enjoyment. The luxurious, friendly restaurants dotting the island offer the best in authentic Anguillan cuisine. Anguilla’s cuisine is legendary among the Caribbean islands. Delicate and delicious, with a focus on seafood. Barbecued or jerked goat is the main meat based dish on Anguilla. Lobster bisque, coconut fritters and callalloo stews are all popular dishes. 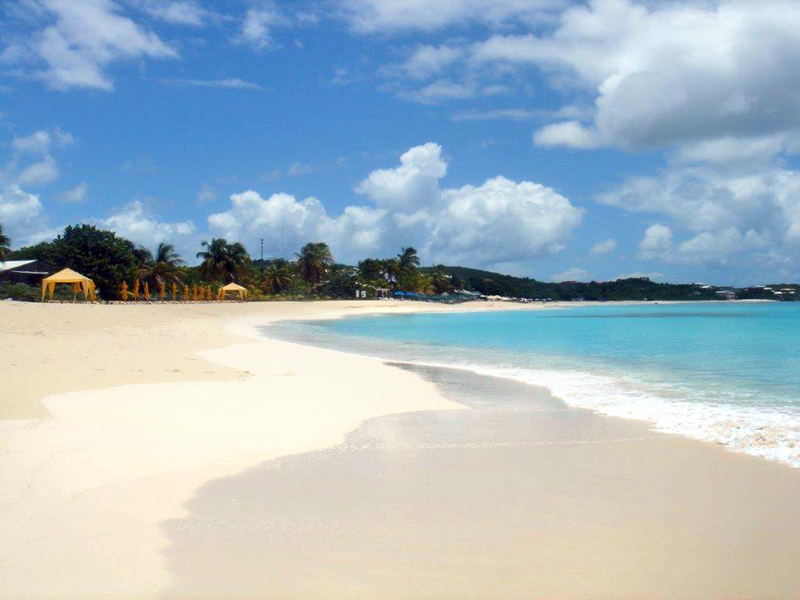 Anguilla is known for it’s warmth and hospitality. Visitors love the offshore cays and sensational sunsets. Beachside relaxation and island exploration are equally available. The vibrant night life includes live, local music in nearby venues. Prickly Pear (a couple of miles offshore) is well worth a visit. Enjoy an ice-cold beer from the Prickly Pear Beach Bar for a casual stroll along the sand as the waves gently lap your feet. The island is also known for it’s art; check out the Devonish, Stone Cellar and Loblolly art galleries. Weddings in Anguilla – This quintessentially Caribbean island is named for its eel-like shape, which twists and turns along stunning Caribbean beaches that are frequently voted among the world’s best. Here, you will find 33 unblemished white sand beaches that are almost always quiet and uncrowded. Getting Married – Couples marry under the authority of a special license that takes approximately two working days to process. Both parties must present proof of citizenship of their resident country. These documents are the same documents that you will need to fulfill your entry requirements when visiting Anguilla; your passport or an original birth certificate accompanied by photo identification such as a driver’s license. Two witnesses are required. If applicable, a divorce or death certificate must be present. Marriage License Cost – If one partner resides in Anguilla for at least fifteen days prior to the date of marriage, the cost of the license is US $40. If the stay is shorter, then the cost of the license is $284 (representing stamp duty). Honeymoons in Anguilla are romantic as they are tranquil. This beautiful island in the northern Caribbean is becoming a popular honeymoon destination, with its friendly atmosphere, pristine white sandy beaches. Some even say, the best in the world. Discover Romantic Anguilla, and island not too many people could point out on a map, with stunning luxury hotels, boutique hotels and a collection of outstanding luxury villas.